Japanese crochet books are renowned for having beautiful photographs, clear schematics, and well-presented charts, making it possible for crocheters who don't read Japanese to still use the patterns successfully. 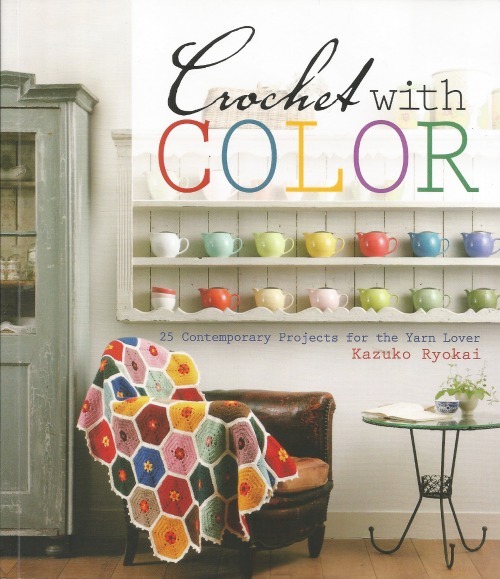 Crochet with Color, an English translation of a Japanese book, makes it even easier for English readers. With a brief introduction to yarn weights (the chart provided is from the Craft Yarn Council of America - www.YarnStandards.com), gauge, how to read a crochet chart, and illustrations showing what each symbol used means (for example, the illustration for the chain stitch symbol shows a hook pulling a loop through a chain), crocheters who are comfortable reading charts and have a CYCA rated Easy or Intermediate skill level may be able to jump right in and get started. Yarns are not specified by brand; each pattern lists a quantity and weight [ex. 49 yards (20 g) of aran-weight (#4 medium) merino wool in blue]. While it can't be guaranteed that the reader can make exact matches for every project, a quick skim through Knit Picks and through WEBS suggests to me that crocheters should be able to find close matches without too much trouble online, and taking the book to a craft store or yarn shop could make color and texture matching even easier. Originally pubished in 2008 as Kirei Iro No Knit Zakka by Shufunotomo Co., Ltd., this book has been translated by Miho Atsumi (World Book Media) and published in the US by North Light Books. The Ravelry database has 9 patterns listed, under the book title Zakka in Pretty Colors. I'm not sure how much it differs from the English translation (there's at least one pattern in the Ravelry database that I don't see in Crochet with Color, but that could be an editor's error). A quick peek into Crochet with Color from M.K. Carroll on Vimeo.